Title : Wahrer und Grundlicher Abriss der Welt-beruhmten und Hochheiligen Stadt Jerusalem aller angrenzenden Oertern und Heiligt³mern wie auch anderer Merckwurdigkeiten welche durch das Leben, Wunderzeichen, Leiden, Todt, und Auferstehung Jesu Christi seynd gehei. Map maker : DE PIERRE. Size : 24.8 x 33.9 inches. / 63.0 x 86.2 cm. 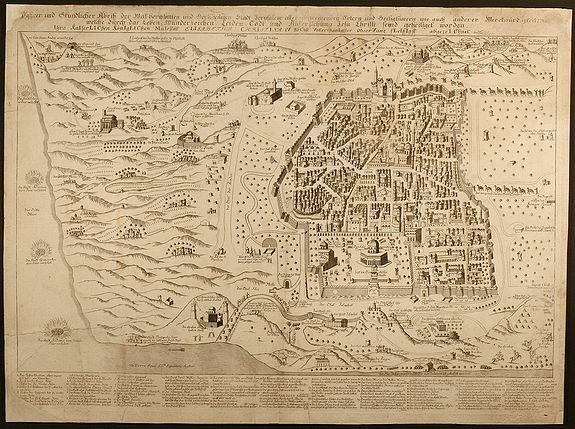 Description :An important and absolutely rare chronogram-dated view of Jerusalem. Only a handfull copies are known : one in the Eran Laor Collection at the Jewish National and University Library, another one in the Hauslab-Liechtenstein collection in the Library of Congress, Washington, D.C. and the third one was sold at Sotheby's, London in 1999. Ihro KaIserLIChen KonIgLIChen MaIestat ELIsabetha ChrIstIna V hoChst VnterthanIgster obserVanz fLeIssIgst abgezeIChnet. This date corresponds with the life of Elisabetha Christina (1691-1750), born as Elisabeth of Braunschweig (Brunswick) and married to Charles VI in 1708, became Queen of Bohemia and Hungary. Her child became the famous Maria Theresia (McGuigan, Habsburgs, New York, 1966). This map is "unusual in its rich details, its reliability, the many illustrations of sites and figures, and the large area it encompasses" (R. Rubin, Maps of Jerusalem, pp.152-153). The representation of Jerusalem is authentic and many buildings can be identified. Many site on the map refer the Christian background but also Arab horseman, Greek monks and camel caravans are shown. A lot of well engraved details are captured. For example Judas Iscariot is hanging from a tree, the graves of the Maccabees, the four cities of Sodom, Gomorrah, Adamah and Zeboim. "De Pierre paid special attention to Christian monasteries in Jerusalem as well as in the Judean Desert. The reason may be that he copied a Greek Orthodox map included in the book by the Greek Orthodox Patriarch Chrysanthos printed in the same year" (R. Rubin). Below an index with 71 numbers is listed, referring to buildings and sited within the the city itself. Around 100 additional descriptions outside the city walls are printed within the map close to each site location. The identity of the author itself in unknown. The only indication is "De Pierre Eques S.S. Sepulchri" which appears in the lower left edge in the map. "This title was bestowed by the Franciscan order in Jerusalem upon European Catholic noblemen who had completed a pilgrimage" (R. Rubin). References: E. Laor: "Maps of the Holy Land", Amsterdam, 1986, pp. 145-146 / R. Rubin: "The de Pierre Map of Jerusalem, 1728", 16th International Conference on the History of Cartography, Vienna, September 1996 / R. Rubin: "The De-Pierre map of Jerusalem 1728", Studies in Geography and History in Honor of Yehoshua Ben Arieh, Jerusalem 1999, pp. 1-28 (Hebrew) / R. Rubin: "A Chonogram-dated Map of Jerusalem", The Map Collector 55, pp. 30-31. Condition : The sheet is carefully professional restored, a restoration protocol will be added. One imperfection in cent coin size within the picture area backed with old paper, corners backed with old paper, some minor losses at top left corner within the title and lower left corner within the index, several tears (one large) backed with Japan paper, still some water stains and gereral staining visible.